Tower. Richard III, Act III, scene 5. Thomas Medland. ART File L847t2 no.3 (size XS). Before 1812. Folger Shakespeare Library. As Shakespeare plotted the deaths of many of his characters, he often turned, logically enough, to highly theatrical causes of death, from sword fights to knife-wielding conspirators. Yet poisons—quiet, powerful, and sometimes secret—sometimes play a key role, too. Romeo dies by drinking poison. Poisons are central to the plot of Hamlet, which begins after Hamlet’s father dies from a substance dripped into his ear (a scene that is recalled in the play within the play) and ends with a deadly scene that includes poisoned wine and a poisoned sword. In King John, which debuts in a Folger Theatre production on October 23, the king meets his end when he is poisoned by a monk. Frightening, mysterious, and somehow fascinating, real-life poisoning cases (or cases that might include poison) intrigued the public in the early modern age just as much as the murders they saw performed onstage. One infamous example was the death of Sir Thomas Overbury in the Tower of London. Sir Thomas Overbury. Simon van de Passe. ART File O96.6 no.3 (size M). 1614. Folger Shakespeare Library. An arranged marriage, a scandalous trial, political scheming, and a poison tart—no, they aren’t the convoluted plot points of a long-lost Shakespeare play, but the ingredients to a scandal that rocked the Jacobean court. If you haven’t heard of the Overbury affair before, settle back, relax, grab a cup of tea—but make sure to make it yourself—and get ready for a story of intrigue worthy of its own premium cable series. Frances Howard was 14 when she married the 13-year-old Robert Devereux, the 3rd Earl of Essex, in about 1604. The union between the two teenagers was no Romeo and Juliet love match, but a political alliance between two powerful families. 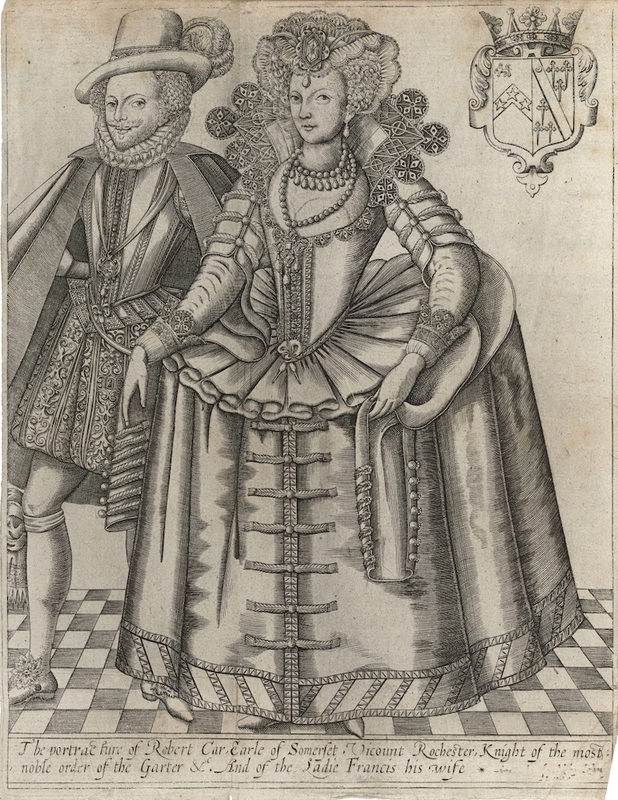 Since they were so young, the families thought it prudent to keep the young couple separated, during which time Frances was sent to King James’s court and Robert Devereux left for a European tour. Not much later, in 1607, a young man named Robert Carr was finding favor with the king. Carr had caught James’s eye during a jousting competition in which Carr broke his leg. The monarch took it upon himself to nurse Carr back to health, and he quickly rose in fortune. King James wasn’t the only one to notice Carr’s finer qualities. By the time Devereux returned in England in 1609, Frances was in love with Carr and wanted nothing to do with her first husband. But how to get rid of Devereux? The answer came in 1613, in the form of an annulment suit that argued the marriage was not legal, as it had never been consummated—a fact neither party disputed. In addition to the unsavory qualities of the trial (at one point, witchcraft was even brought up as a possible factor), the political implication of Frances breaking ties with Devereux for Carr was substantial. The Howard and Devereux families were well established; famous Howard relations included Anne Boleyn and Catherine Howard, each of whom married Henry VIII and was subsequently beheaded. Carr, on the other hand, represented a new breed of Scottish nobleman that had arrived in England after James’s accession. Moreover, the death of Robert Cecil, Earl of Salisbury and secretary of state, in 1612 had left a power vacuum in the court. Carr, the popular favorite with the king, and now the Earl of Somerset, was a powerful ally for the Howard family to have. Not everyone was so keen to see the Howards consolidate power. One of the chief opponents of the match was Sir Thomas Overbury, Carr’s secretary and close friend. He advised Carr against putting his lot in with Frances and, when that didn’t work, he did what any concerned friend would do—he wrote a poem. Overbury’s A Wife described all the qualities found in a virtuous woman and was seen as an indirect attack on Carr’s intended, through the implication that she lacked all of them. In an attempt to remove him from the situation, Overbury was offered an ambassadorship. Overbury rejected the post and, since this displeased King James, was subsequently sent to the Tower of London, where he conveniently died on September 15, 1613. Ten days later, the annulment was granted. Two months after that, Frances Howard became Frances Carr, Countess of Somerset. Five yeares of King James. Micahel Sparke. S4818 copy 1. 1651. Folger Shakespeare Library. End of the story, right? Well, not quite. Time and the court moved on, and eventually Carr’s standing began to slip, as he was replaced by a new favorite, George Villiers. The cracks in Carr’s armor allowed for the persistent rumors—that maybe Overbury’s death wasn’t entirely natural—to gain credence. James eventually ordered an investigation. 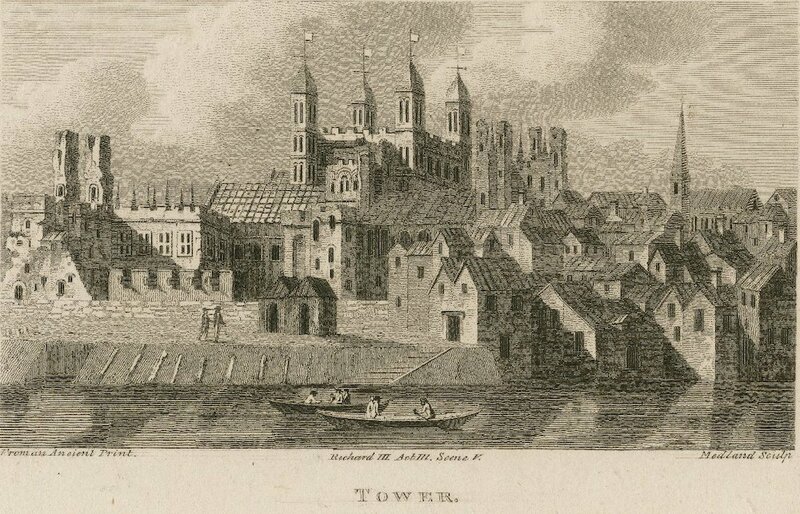 Overseen by Edward Coke and Sir Francis Bacon, the inquiry found that Howard had pulled some strings to have Overbury tended in the tower by one Richard Weston. Weston industriously delivered to Overbury a number of poisons contained in such things as “Tarts and Jellies” and finally within a “Glyster,” or enema. These poisons were arranged by a Mrs. Anne Turner, a confidant of the Countess’s, who had possibly familial connections to the astrologer Simon Forman, and were supplied by an apothecary named James Franklin. The governor of the Tower, Sir Gervase Elwes, was also implicated. All roads led back to the Countess, who eventually confessed to the plot, though her husband maintained his innocence. All six were found guilty in late 1616. The accomplices were hanged, while Carr and Howard were released after a time spent cooling their heels in the same place where Overbury had met his untimely end. 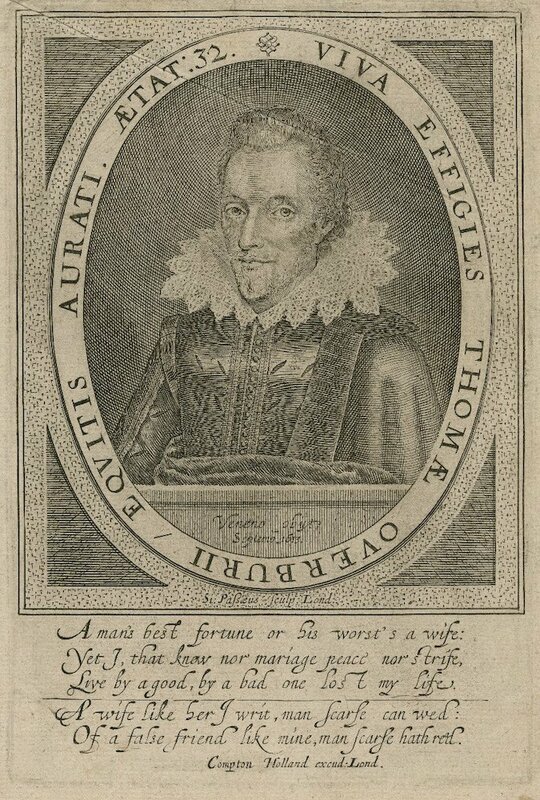 Sir Thomas Ouerburies vision. With the ghoasts of Weston, Mris. turner, the late Lieftenant of the Tower, and Franklin. Richard Niccols. STC 18524 Copy 1, title page. 1616. Folger Shakespeare Library. These are but the bare bones of an incredibly complex and fascinating story, but there’s still so much we don’t know. For one thing, rumors circulated that the plot to kill Overbury may have had royal involvement. For another, legal proceedings were often based on power and perception rather than evidentiary proof, and who is to say that the surviving documentation is the full truth? We may never have a complete picture of what happened in the Tower… but at least we have a good story. Join us for King John at the Folger to witness yet another poisoning—which plays an important part in Shakespeare’s play. And to learn more about the Overbury story and other dastardly deeds from the early modern era, try What’s Your Poison? 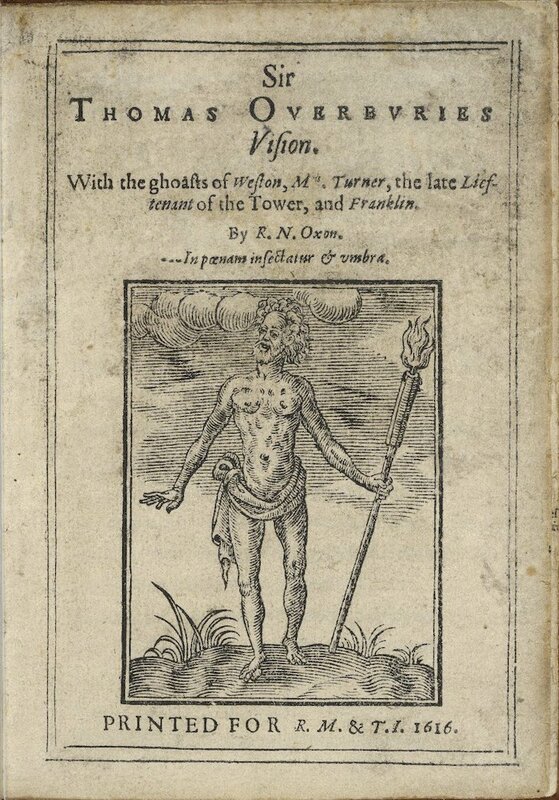 on November 2, a pre-performance Folger Friday just after Halloween. I believe Hamlet’s dad had mercury (a liquid) poured in his ear. Not sure if that would be immediately poisonous, but if would be bad. “He advised Carr against putting his lot in with Frances and, when that didn’t work, he did what any concerned friend would do—he wrote a poem.” Brilliant!! !